Enjoy life in just one step, opt for puncture-proof, tear-proof and anti-kink stainless steel hoses to give you a better experience. It is much lighter than a regular hose, and it has a lot less drag on the ground so you don't have to yank on it when you move to a new spot. It also doesn't twist, or kink and cut off the water supply, like a regular hose so you don't have to spend any time straightening it out like you had to do with the rubber hose. Premium quality 304 stainless steel outer tube gives you a light experience without worrying about rust and corrosion and enjoying the pleasure of watering. The two nozzles can be replaced at will, with one more choice and more fun. PREMIUM MATERIAL - Made of premium quality 304 stainless steel for supreme durability. 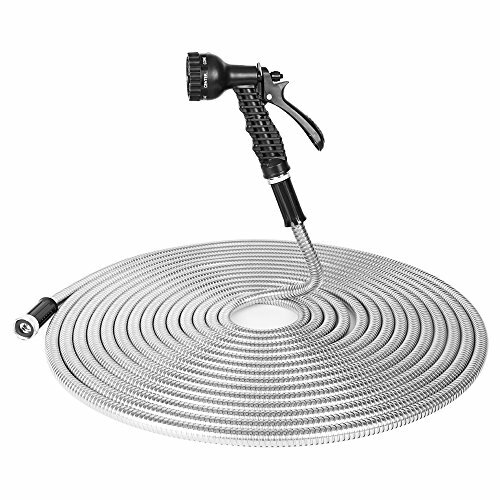 Anti-Corrosion and Rust-Proof, guarantee the longer service lifespan of stainless steel metal garden hoses. FLEXIBLE, ANTI-ENTANGLING - 50 ft metal garden hose can be bent to a large degree without tangling and kinking. If you often need to use a hose, you can quickly and easily connect the faucet, it is easy to roll up and store after use. LIGHTWEIGHT AND EASY TO CARRY - Lightweight metal hoses and nozzles will not make you feel heavy. You can easily transport metal hoses anywhere. FREE EXTRA NOZZLE - Comes with a free "7-ways Spray Nozzle" and extra "firefighter nozzle", can work well under low water pressure and high water pressure, with various forms of spraying, suitable for family, work, camping and other occasions. EXTENDABLE DESIGN - When one metal hose doesn't reach the length you need, every two can be connected to make it longer as required. Support varying nozzles for multiple purposes. If you have any questions about this product by BOSNELL, contact us by completing and submitting the form below. If you are looking for a specif part number, please include it with your message.